Think a good pre sesh. You know roughly know how it feels, at the race just one pip faster, plus a strong full finish should give you a good bit extra. You do have the race start delay, don,t look at that to much, takes 10/15 strokes to get that undone. Rest up, like you like it and give it your best! Thanks! I haven't tested my 1K since I did my sub 3:00, so my goal is to try and do that again - maybe PB by a few tenths, see how I feel. Have a good race plan, don,t start to fast, ignore the others during the first half, leave nothing in the last 100m. Do that and you have a sub3 chance. OK Henry, I will have more details in the "PB" post but I tied by PB and broke 3 minutes again with a 2:59.8 - it took all I had but I was happy. Read the race report, you are not fooling yourself, the delay is real, how much I don,t know, but its not a few tenths. Its reaction time plus some other delay in the system. This clearly does beat your home pb. You paced it well, nothing you could have done better. Congrats Now your 2k ....... make a good plan here also. Thanks so much and as always thanks for the advice. Any good suggestions for the next 13 days before the WRIC? Just keep mixing in some harder intervals with SS work and hard mid-distance and maybe do a 90% 2K like I did for the 1K? Yes a few hard sessions are in place. A 2k one week before, race warm up, time of day just like race day. Do them all just below max, build confidence and get to know the distance. Go a bit by feel, make sure you ate rested, have confidence and a good plan. 30r20; 7871m @ 1:54.3 pace. Still nursing that right lumbar strain from the 100m PB a few weeks ago... Lucky for me it wasn't a problem at all during last weeks races but I woke up this weekend feeling really stiff and sore for some reason. Anyway... Tonight I gave it 2500m of negative splits to test it out. Felt fine up until the final split when I started to dip under 1:50, that caused a little bit of pain.... Still managed to hold 1:43 over the final 200m... Otherwise it was okay above 1:53 pace. Not sure what to do next... Any suggestions? Great 1k Keith. The lag in a race can be about 1 full second depending on your reaction time. Really big deal in the 500 of course and your 1k is defo better than the gym one. The reason it takes so long for the average rate to drop is that the PM is taking an average of each stroke including the first few that are way over your target of course. It just takes a while to "wash" them out of the system. You might want to have a look at the ISS interactive plan which programs in a taper with a race day finish - some good ideas. Makes the point that you can't really get any fitter now so it's all about sharpening and getting some sub2k pace intervals and shorter pieces. 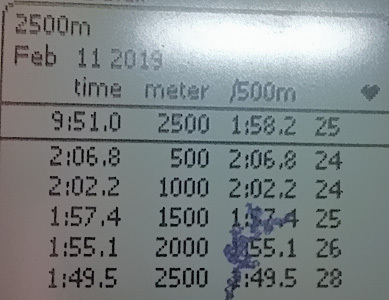 Thanks Lindsay.....interesting on the lag in the race time, I have done some other comps (2K) and never really noticed it but I wasn't as keyed in to my pace as I was this time and with it being shorter it made a bigger difference especially as I was fighting for a sub 3:00. Will look at the ISS plan, going to do the 2K at 90% as Henry suggested and see what else - have been fighting a cold a bit too, so may need to take a day off. I thought I was still coughing from the comp but I am now thinking its a combo of that and not feeling 100% - anyway, want to sharpen things up in next week and a half. Yesterday: Steady state 220 watts on the stationary bike for 35 minutes. Back squats to 205#. Bench press at 135#. Today: 3K warmup (feet out for final 1K), then 3 X 10 minutes (22-24-26 SPM, splits 2:05-1:59) plus easy cool-down meters. Last erg session for about a week -- time to go to the mountains for some snowboarding. Pow-pow awaits. Just a 'casual' 30 minutes. Target was to be 2.5 seconds on pace slower than my SB and was bang on (183 metres less) so happy with that. Easing down to the 2k race on the 24th as I'll blow up if I go too fast now...my old body needs to recover from all the hard stuff I've done recently...my feeble, aged brain is telling me it's had as much as it can take now too! Rainy day blues. Was supposed to row OTW in my 4+. Evening: standing shoulder press: 3 x 5 @ 140/145/135 (wasn’t feeling it. Must have been the gigantic burrito I had at lunch). Then went to do some 1:30 pieces with starts. Was going around 1:36.5 and r34/35. Didn’t last long. Got 4 of em in. Some days don’t work as well as others. One thing new is that I’m not as able to pull lighter strokes (ok big dogs, I know mine are already light) as well as I used to. Seems like I’m wanting more power per stroke. But I would need to lighten them up to go any distance.